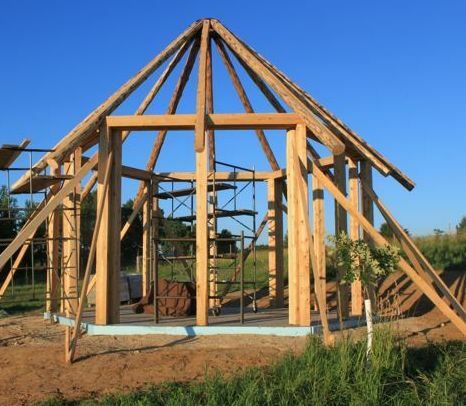 The Kinstone Chapel is the heart of Kinstone, our permaculture school near Fountain City, Wisconsin. 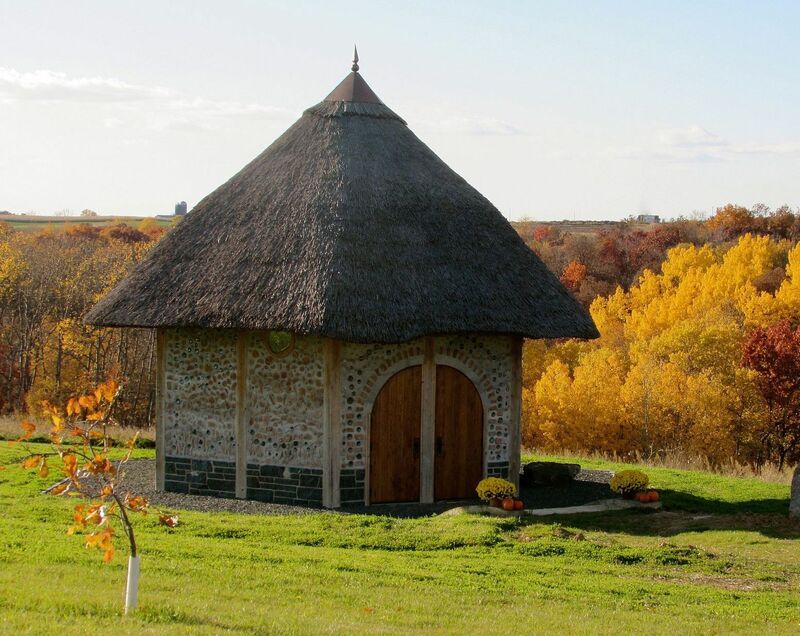 The chapel building is a 12’ x 12’ hexagonal cordwood structure with a thatched roof … and walls full of story and magic! It is a place for personal solitude and quiet time and can be rented for celebrations. The two handmade wooden doors weigh 260 pounds apiece. There are over 1,000 bundles of reeds in the thatched roof; mostly harvested just 10 miles down the road in the Mississippi River backwaters. Over 450 bottle-ends create a design in the walls entirely based on the beauty of the earth. Some highlights include the sun, moon, flowers, birds, a tree, a dragonfly, fireflies, a river, mighty winds, clouds, fire, starry night skies, the Eternal Flame and a rogue doorknob into the unknown. A special wood carving graces the doorway showing Native American motifs from tribes that wandered this land before the first of the four generations of my family settled here. The elegant stained glass windows allow in plenty of sunlight without distracting the eye. 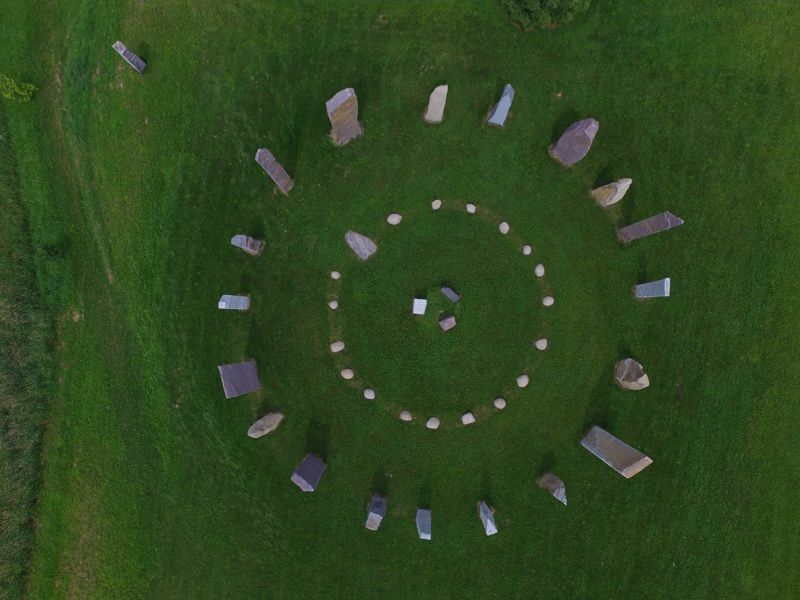 Columcille Megalith Park in Pennsylvania is the life work of William Cohea Jr., now 87 years young. I have fallen in love with the place and the man. A beautiful hexagonal stone slate-roofed stone chapel was hand-built by dedicated friends working together over a season and is the inspiration for the Kinstone chapel as well as the approach to building it. The idea of cordwood and thatch originated with my good friend, Wayne Weiseman. Using natural materials is an important practice that I have been learning more about since 2010 when we started Kinstone using Permaculture principles. The selection of cordwood, stone and thatch has conspired to create a structure of wonder. Over 110 people helped build this chapel, and each one’s spirit permeates it still. The use of natural materials was paramount. 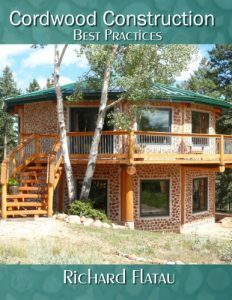 We chose cordwood because of its suitability in our Wisconsin climate and because we love how it looks! We decided to build a 2’ stem wall out of a dark blue “hornblende gneiss” from Krukowski Stone in Mosinee, Wisconsin. Further, we decided to use local thatch for the roof. This roofing material is proven in many areas of the world; we thought we would give it a try here and document our results. With plenty of Phragmites australis water reeds found locally in the nearby backwaters of the Mississippi River, we thought this would be doable. It was quite an undertaking, as harvesting enough thatch took two winters to complete! The Department of Natural Resources is willing to allow harvesting of this reed, as they consider it to be invasive. The framework on an insulated floating slab. To make bottle ends, we started saving glass bottles, jars, vases and even bowls of all shapes and colors. 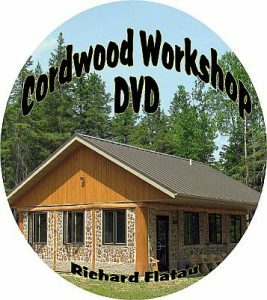 As for the cordwood itself, we did not have wood onsite that we could cut, prepare and dry in time for our planned project start, so we took Richard Flatau’s advice and called on Rapid River Rustic in Michigan for help. We placed an order for several cords of very dry northern white cedar cordwood, twelve cedar posts (each 12’x 8” x 8”), thirteen red pine pole logs (each 24’ long and 8” to 12” in diameter) for the rafters, and several unique, center-rot cedar logs that we would use to inspire creativity in the cordwood walls. Once we had decided upon materials, we worked on plans for the frame. An architect rendered the initial drawings. We would use post and beam framing for 16” thick walls and set it up with a steeply pitched roof to support the use of thatch in our snowy region. Due to a last-minute design change, the walls are only 13” thick in some areas and 16” in others. This made for careful cutting to ensure we had the correct length cordwood available for each worker. In hindsight, simpler is always better, so plan carefully, right from the get-go! Collar tie and tension ring. Once we had a plan, we needed to determine its exact placement on the land. There have been many interesting coincidences as Kinstone has been built. The chapel itself was sited based on the idea that triple threes continue to spontaneously appear at Kinstone. We placed the chapel 333 feet from the Labyrinth and almost the same distance from the Stone Circle, creating a nearly equilateral triangle. My friend and neighbor excavated the chapel spot creating a nice flat circle of level gravel from which to start. A local concrete company poured the floating slab with a 16” thickened edge to support the 16” cordwood walls. ) The floor is 4” thick. The contractor’s term for this type of slab is a turned-edge, frost protected, shallow foundation or FPSF. The cordwood, posts and rafters were delivered in one big load. At the same time, we also received our local sawdust and sand. We covered the pallets of cordwood and other materials with tarps to protect against the weather. We purchased Portland cement and Hydrated Lime on a “just-in-time” basis to ensure it was fresh. We hired a local contractor to erect the post and beam frame and raise the twelve red pine pole rafters to form the steep roof. The top called for a collar tie (also called a ring tie) to hold all the rafters together. This had to be custom made. In addition to the collar tie, the architectural plans called for a tension ring to be installed where the rafters meet the top plate of the building frame. This was also custom-fashioned by the same craftsman and made for a beautiful floating ring, centered between the peak of the roof and the floor, with spokes going out to the six corner rafters. 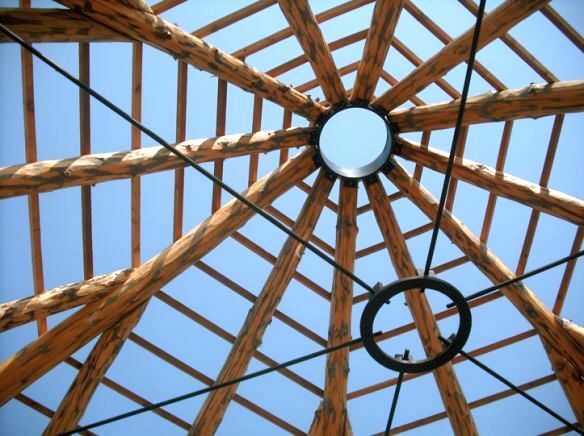 The final touch to the roof structure was fastening the cedar purlins to support the attachment of the thatch. 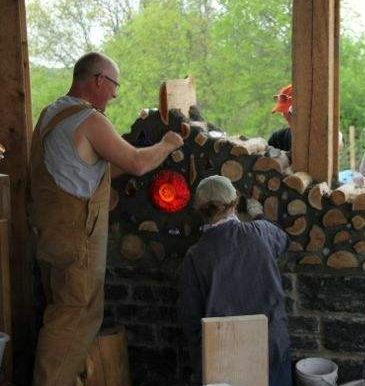 In 104°F heat (July, 2012), Richard and Becky Flatau laid the first mortar beads and log ends in the Chapel as they taught the first Natural Building Workshop at Kinstone. 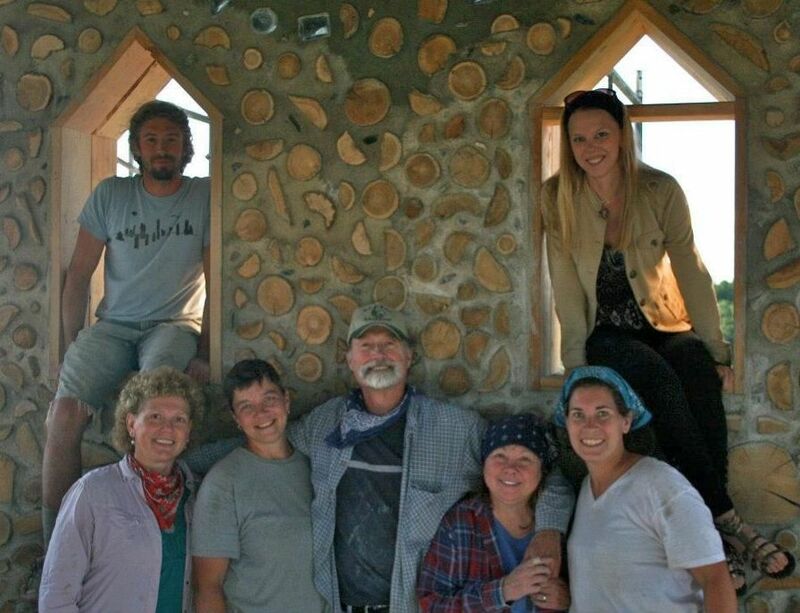 This was the first of four cordwood workshops we held specifically to work on the chapel. We also held many volunteer work days and weekends that brought folks from all over to assist. We declared the cordwood finished in October, 2013. 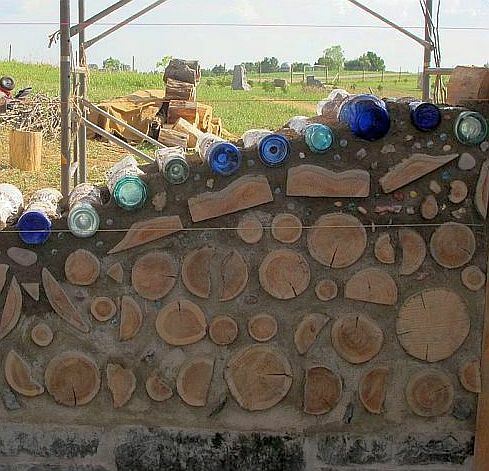 Workers instilled a piece of themselves into the wall by using their individual creativity to place logs and bottles into the grand design. Even now folks will come back and point out what portion they worked on and what they tried to convey in their own way. The cordwood walls themselves have their own story; I have written more details about that in “Kinstone Chapel: Signs and Symbols,” found at www.cordwoodconstruction.org and www.kinstonecircle.com. they allow light to pass through. The resulting “stained glass effect” is stunning. One student, Kaitlyn O’Connor, took the liberty of laying out bottle ends on the Kinstone porch in ways that evoked certain natural phenomenon – like rivers, trees or the sun. This struck a chord with me and reminded me of Saint Francis of Assisi and his 12th century poem of praise to God for the things of the earth: The Canticle of Brother Sun and Sister Moon. This was the beginning of a process of designing the main elements of this poem into the walls of the chapel. On day one of learning cordwood (and perhaps every day thereafter! ), we challenged our teachers. 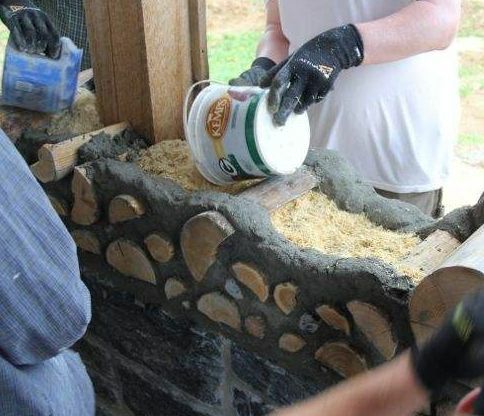 The first course of mortar and log ends was progressing nicely until one group decided to place some large river rocks into the walls instead of cordwood. “It is the beginning of the river,” they argued. Richard and Becky scratched their heads and thought about it a bit and then gave the go-ahead to do it, with a caveat that they had not tried this before. The stones were stacked a few high, inside and outside, to represent the edge of a river. Blue and green bottle ends were laid out in a meandering line from this rocky beginning to represent water. This line of bottles goes across two walls of the chapel and now represents “Sister Water” in the poem, but is also placed to mimic the Mississippi River just a mile away. Being our first cordwooding experience, we immediately found that just placing random cordwood log ends would be much faster than placing cordwood, bottle ends and stones to evoke a particular design. At this point, we realized that this effort would take much longer than originally expected, but oh, would it be worth it! I made a sketch on graph paper of each section of wall, trying to lay out the bottle-end designs in a way that would help us with placement of logs and bottles. This process was constantly in flux. 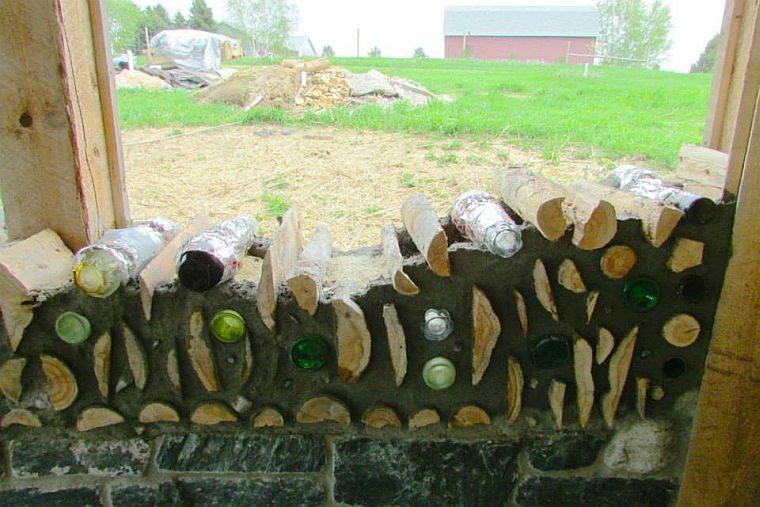 I would walk around with this design in hand, critically reviewing each new layer of cordwood, ensuring that all groups working on the various walls were aware of what was coming next. When someone got close to a section requiring a “flower,” then I handed out appropriate bottle-ends for that feature. When the “river” was coming to a break due to the window, I directed where to start on the other side. When we reached the “skies,” I was there to direct where the “wind” would blow and where the “stars” would glow. Another center rot log turned out to be a near perfect heart. I found a beautiful celestite geode and a chunk of amethyst that felt just right for the center. Using denim insulation to stuff the middle of the log and then mortaring the two ends, we placed these two crystals in the wet mortar, one on the inside and one on the outside. 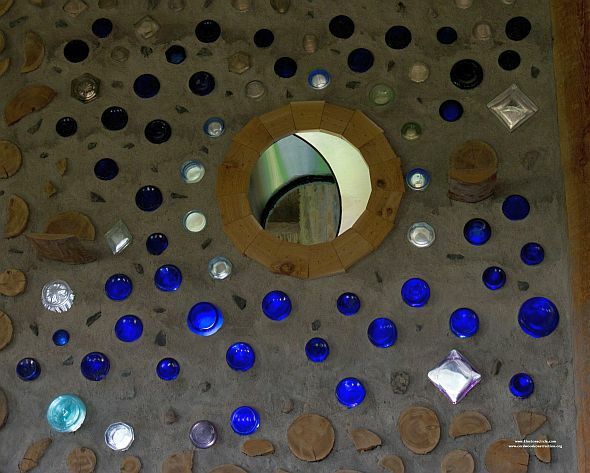 It was intentionally placed in the “Night Wall” amongst the 160 blue and white bottles and “Sister Moon” (a crescent moon stained glass window) that represent the night sky. 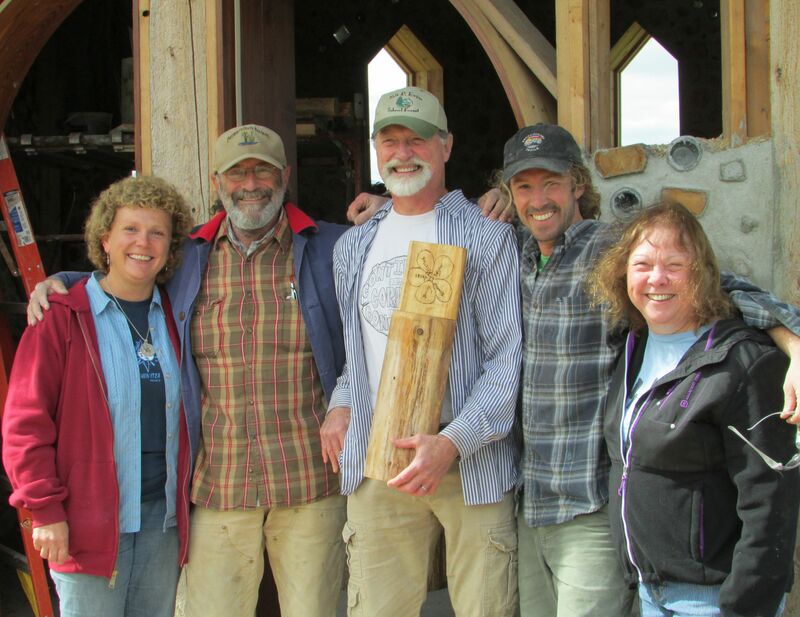 Just as the Kinstone Chapel is the heart of Kinstone, so this piece became the “heart of the night”.We were lucky to have several center-rot logs granted to us by Rapid River Rustic. These were cut into 16-inch lengths, debarked and the center rot was cleaned out by hand, chisel or chainsaw. Some we were able to keep whole, while others had splits or curls that resulted in half-sections of a hollow log – becoming what are known as “ram’s horns,” creating special places in the walls. One entirely hollow log end was used to make an “eddy” in the river. We placed two smaller pieces of cordwood, forming a wave pattern, in the middle of the hollow log, stabilizing them with recycled denim insulation. Once set the way we wanted, we mortared the ends and set a stone in the middle. This truly unique piece helps the “river” just roll along. Thin slabs of cedar became grass, bottles are flowers, a dragonfly flutters and a tree bears fruit. The final wall we worked on was the doorway, the most ornate of them all. A whole row of our curly “ram’s horns” lines the top of the doorway wall. The arched doors and doorjambs were custom-made for this chapel. We had to leave a post between the two doors to support the frame and the cordwood. You can see this post on the outside; on the inside, the space between the two doors is filled with a carving of Native American symbols in a rich, deep, black walnut. A bow of rectangular cordwood pieces (each one shaped specifically for this) goes up over the doors, mimicking their arch. Above that is a bright arch of clear bottles with beautiful shapes and facets. Throughout the area above the doors, we have used the tiniest of log ends, which I call “cordwood confetti.” Richard Flatau lamented that at this stage, the final wall is one where the owner/builder just wants to “get it done” and puts in the largest log ends to fill space. But no, not me! I was adamant that each piece was slivered down to just a teensy-weensy fleck. I was certain that this cordwood confetti would leave us with a sense of celebration and an uplifting feeling as we enter or exit. Indeed it has. We placed many, many small stones in the walls. Every large mortar joint was a target. I have picked up stones from all over the world – including Columcille and Machu Picchu – and nearly all of those stones have found a home in the walls of the Kinstone Chapel, so it really has an international flavor. Besides stones, we have: beach glass from Fort Bragg; northern California redwood; dust from Chimayo, New Mexico; special chestnut log ends from a tree my father loved that died shortly after he did; a door knob from my childhood home; a tangerine quartz crystal; a bottle end full of marbles from my mother’s collection; a copper butterfly; 28 clear quartz crystals; a conch shell … and more! Visitors are fascinated by the variety of odds and ends that are hidden in plain sight. 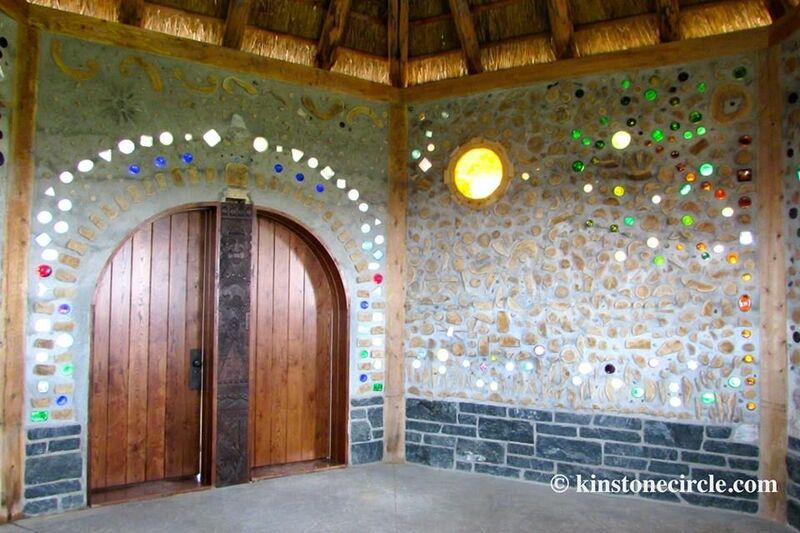 The Kinstone Chapel is so much more than just a cordwood building with a cool thatched roof. It holds within it all the heart and spirit of those that have come together to create it. It embodies what Kinstone is all about. Visitors feel it and become part of it, bringing their own energy to add to the mix. Come feel it for yourself! The process of building the Kinstone Chapel and the feeling of becoming kin was a significant moment in our lives. The atmosphere, the camaraderie, the feeling of soul-affirming work on a project of significance was overwhelmingly satisfying. Kinstone is a special place with wonderful people. “Big Rich” (overseer) and Clare (chef) told us when we first arrived, “Don’t worry, you will get pulled into the vortex” and a positive vortex it became; while walking the labyrinth, passing through the stone circle, sitting by the reflecting pool, eating Mona’s cob-oven pizza, and making merry around a campfire. All the while, the project was teaching us, in Wayne Weiseman permaculture-style, to observe and take note of all the natural phenomena. It is hard to define when an epiphany happens, and this one was gradual, but we feel that our work and play at Kinstone has been a defining era in our lives. Our gratitude could not be greater. 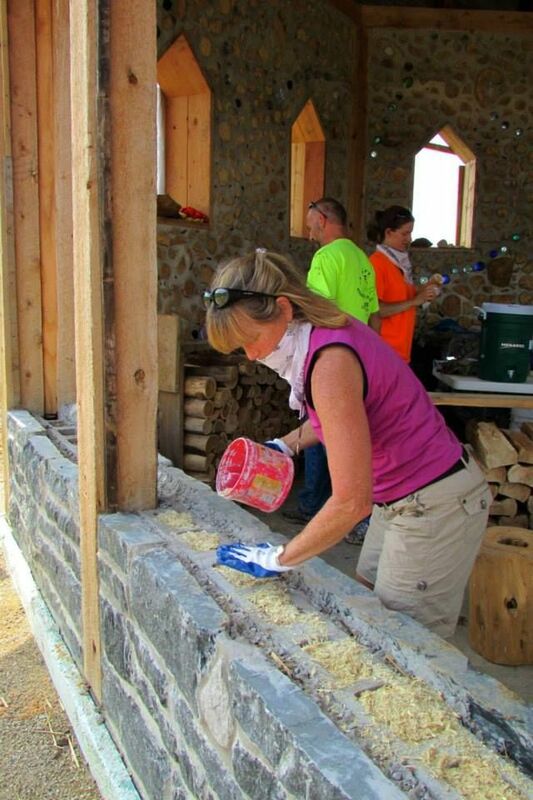 One of the special challenges during the construction of the Kinstone Chapel was to simultaneously teach our students the proper cordwood techniques while arranging the symbols into the chapel walls; all the while endeavoring to keep the project moving forward. It became a balancing act to adjust and adapt as the walls took shape. We have fond memories of the people and how they took ownership of “their” wall section(s).